Admission: No traces have remained of the castle therefore you cannot enter it. However the entrance to the manor is restricted for it houses the library. Parking: It is unknown where the castle was so it is hard to find the parking lot :-) There is a small free parking lot by the manor. Searching difficulty: Location of the castle is unknown. It might have stood at the place of the present manor. You ought to drive down the road no 328 from Wojcieszów lying roughly 10km north-east of Jelenia Góra towards Kamienna Góra. Before Marciszów you need to turn right to Janowice Wielkie. At this place begins the place Ciechanowice but you have to drive on, all the time down the main road, till the junction at which you need to turn right towards Miedzianka. After entering the forest on the left side of the road (around 100m off it) the ruins of some kind of buildings are visible. When you see them you need to drive around 50m as to leave them behind and turn left into the rocky road to the park. Down that road drive to the end where the XVIth-century manor is located. 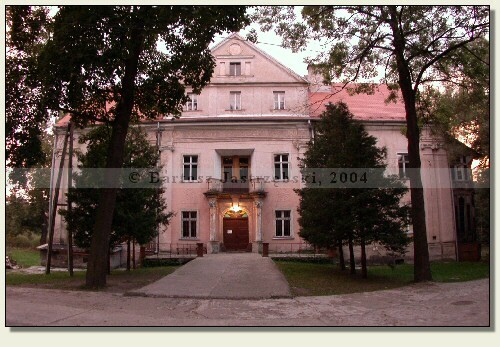 Practically there is nothing known about the castle which was located in Ciechanowice. Probably in the XVth cent. a brick knight’s castle was erected there, however, written documents mention its existence only on the occasion of its sale in 1451. Brothers Opitz and Hayn von Czirnów then gave up the castle along with fief to Hans of Mysłów for 800 Hungarian guldens. There is no more information about the castle. Moreover, the XVIth cent. 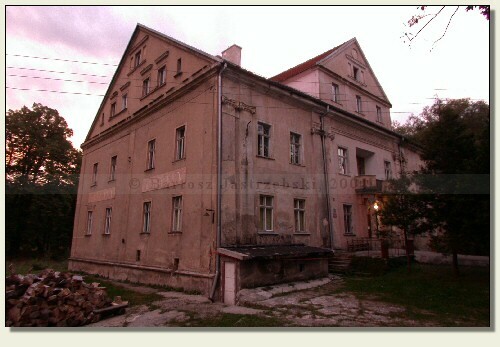 manor is situated in the village, which was reconstructed in the XIXth cent. but it is unknown whether it was raised at the place of the castle or perhaps it does not have anything in common with it.